As World Ocean Day approaches, it’s timely do a health check on the biggest part of our planet – and the prognosis isn’t promising. It’s estimated there are 5 and a quarter TRILLION pieces of plastic in our waterways – or put simply 15 grocery bags of garbage for every metre of coastline in the world! Take a moment to consider that – enough rubbish to completely cover the shoreline of our planet, several times over. Even more frightening is the prediction that the volume of plastic will out-weigh fish in our seas in the next 30 years – is this the legacy we want to leave our children? It’s easy to be overwhelmed by the problem, but it is possible to turn the tide on plastic waste, one piece at a time. Education is a big part of the solution – making the connection between rubbish on the ground and the state of our oceans. 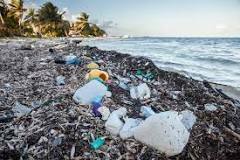 Wind and rain carry plastic bags, lids, straws and packaging into rivers and our drainage system, sending them on a one way journey to the sea. We don’t have to live within coo-ee of the coast to be making the situation worse. Removing rubbish from public areas is certainly a step in the right direction but long term, we need to change our disposable lifestyle. Convenience has cost our planet dearly and while re-usable requires more planning, effort, and often expense, can we really afford not to? The ocean produces more than 70% of the oxygen we breath and absorbs carbon dioxide to help keep the planet healthy. At Ocean Life Education we make it our mission to help the youngest members of community understand and respect our oceans by connecting with our ocean ambassadors. Older children have the opportunity to study the ocean environment in more depth in our Marine Biologist for a Day programs. We are always blown away by the passion and dedication of many of our younger generation towards marine conservation – but to really make a difference, we all have to get on board with the need to save our seas. This entry was posted in Uncategorized on May 30, 2018 by oceanlifeeducation.